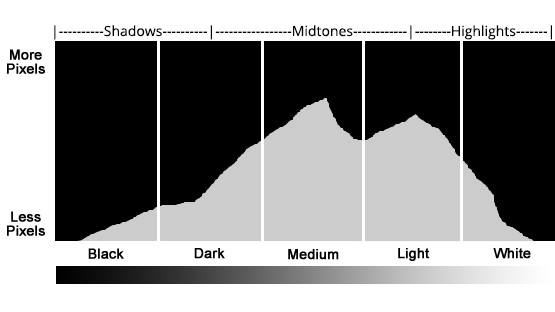 A Histogram is an image-wide exposure indicator that can act as a replacement for light meter usage in digital photography. The Histogram is a chart that displays the exposure range of an entire image and displays that data as a a tightly spaced bar chart. The veritcal lines on the left side indicate the presence of darker pixels being recorded in the image as the right side of the chart indicates lighter pixels. Each veritcal line in the chart represents levels of pixel exposure throughout the recorded image. There are always varying conditions when shooting with a digital camera. Sometimes you're outside in very bright contitions trying to view your image on a small monitor on-board the camera or an external monitor that is subject to the same bright condition and environment reflections. Ever when shooting in controlled conditions inside, it is often difficult to know if your monitoring equipment is calibrated properly or you are in the most ideal viewing conditions. These instance are where the Histogram is most effective in assisting you as you set an exposure and shutter to create your image. A Histogram is a quick referece tool for visualizing the overall exposure of your image to be sure that you have enough details in in dark areas and not too much overexposure in the brighter areas of your image. The Histogram is a very detailed chart that displays information that can be read for various reasons, the most important being a quick reference to the photographer to see what is the overall exposure of the image being captured. Most histogram displays assume that the camera is operating within a latitude range of 5-stops or ranges of exposure. Those ranges can be imagined as 5 distinct columns across the histogram chart display. The histgram has a 'resolution' of it's own density of lines along the graph. Within each of the 5 major columns we imagined above and depending on the size and resolution of the screen that the histogram is being views on, there will be a divide of individual lines equally filling the space within those 5 columns. The histogram will display as much information within it's internal 'resolution' that is possible, which simply means that the histrgram will display as much information as is possilbe in it's current view size. That information will display as individual lines that represent the amount of exposure detected for pixels within that range of exposure. If the image has a lot of darkness within it's frame, the left side of the historgram will have many tall lines in the darker exposure columns. At the same time, areas of the image being captured that have lightness in them will be displayed on the historgram as lines of potentially varying heights along the right side of the histogram display where the lighter exposure values of the image being recorded will be shown. Any image may contain a range of dark and light areas, or mid-tones that are within the middle range of exposure. There is no right or wrong with a histogram display as it is only showing in a mathematical display what the photographer is intending to record within the frame. A histogram is an technically agnostic tool, it simply shows what the exposure reading is across the entire image.